Meet the barbecue on the go. Designed with a serious flair, this is a perfect choice for people who like to set up a barbecue every now and then. The outer case of this ingenious item is made in the shape of a stylish briefcase; replete with a stylish design, belts covering from both sides as well as a choice of available colors. However, open the Mon Oncle and the whole thing transforms in to a bbq. 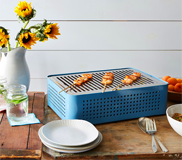 This is a simplistic, tabletop barbecue that is hard wearing, and quite useful. Use it on your terrace, on the balcony or inside your home, and this unique design will provide you with a cooking experience of a life time. The structure of the Mon Oncle BBQ is perforated with a number of tiny holes that not only enhance the visual outlook of the BBQ, but also enhance the flow of air, hence enhancing the overall power of the design while also increasing the temperature of the grill. More importantly, this also ensures that the outer briefcase does not overheat. This matches perfectly with a coconut shell ecological charcoal, which produces no flame and also manages to retain heat while generating minimal amounts of smoke. E27 - E26 (Max. hgt. 160 mm). Input voltage : 230 VAC. Tell us what you think about the MON ONCLE Barbecue. It will help us provide you with better products in the future and help your fellow BarcelonaConcept shoppers make better purchases.